Great Plains Bentonite is made with the most powerful detoxifying bentonite, known technically as montmorillonite. It is a natural clay mineral of volcanic origin, created from volcanic ash deposits that are millions of years old. Some of the largest and highest quality deposits of bentonite occur in the Great Plains area of the United States. Bentonite is made of microscopic rectangular clay platelets, that when properly hydrated in water form a porous honeycomb or house of cards structure with an enormous surface area. Great Plains Bentonite has maximum activity through special selection and processing to ensure an enhanced surface area and optimum adsorption. Studies have shown that maximum binding and removal of toxins occurs only with the rare naturally occurring sodium ion form of bentonite containing a specific range of exchangeable sodium ions. Using advanced processing methods, the special bentonite used in Great Plains has a huge absorptive surface area over 8,100 square feet in one tablespoon serving. To put that in perspective, the total surface area to grab unwanted substances in one tablespoon serving is more than the floor surface area of four average size 2,000 square foot homes. 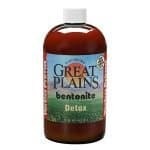 Great Plains Bentonite has maximum purity. There are many different grades of bentonite, primarily designed for industrial uses. Yerba Prima uses only food grade and USP/NF pharmaceutical grade bentonite that has been through a water-washing four-step purification process. This not only ensures that the bentonite is ultra-pure, but also contributes to the light color and strong activity of Great Plains Bentonite.